Anybody using a "Magic Skew"? Just curious what the difference is between this and a round carbide tool held at a diagonal. Last edited by ramaroodle; 01-24-2019 at 01:13 PM. The shaft. On Bob's Magic Skew it is Hexagonal, not square or round. The angle produced by resting it on the side flat gives you a perfect skew angle (at least for me). I can never get a traditional skew right even after a lot of practice. The Magic Skew solved all my problems of using a skew. Yeah. I saw that the shaft was hexagonal but otherwise looks like my round carbide tool. I've had pretty good luck with the skew also. Seems to give me results similar to 400-600 grit paper if I'm careful and keep it honed. I'm now down to some or all of a combination of three tools when pen making, depending on the wood. I will either use a roughing gouge, and/or a round carbide and then a 3/4" skew for finishing. 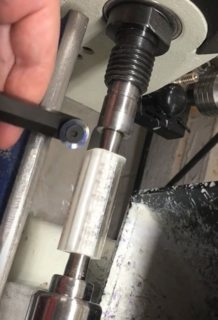 Does the hexagonal shape somehow "lock in" the perfect angle or is that something that can be achieved with practice on the carbide tool? Last edited by ramaroodle; 01-24-2019 at 01:35 PM. You could achieve same with practice. The Magic Skew makes it very simple to achieve same angle every time. For a number of years I have been using Ken Ferrell's (bitshird) Woodchuck Pen Pro for all my pens, using Global Toolings R4 15mm inserts, with great success. I recently purchased the Magic Skew, and let's just say I still learning with it. Right now I using it to round my blanks to about 1/16 inch proud, and then I switch to the Pen Pro to finish off. I am experiencing chatter, especially when turning right to left. Not as pronounced left to right. I have one of Rick Herrell's flat tool rests, and I have it set so that the carbide insert is slightly above center. FWIW. The shape of the shaft locks in 30 degrees, and makes it very easy to repeat it. slightly above center is where you should be. Chatter could be caused by taking too big of a bite or flex in your mandrel. Try lowering the rest just a tad.